Kim Kardashian and Khloe Kardashian check out Kanye West‘s “Sunday Service” at the 2019 Coachella Music Festival! The Keeping Up with the Kardashians stars, ages 38 and 34, respectively, teamed up to watch the 41-year-old “I Love It” rapper’s set at the event on Sunday (April 21) in Indio, Calif.
Kim sported thin sunglasses and a light purple, sleeveless turtleneck top while supporting her husband, while Khloe donned a light yellow dress with oversized sunglasses, tan boots, and a Louis Vuitton bag. They were also joined by their family members Kris Jenner, her boyfriend Corey Gamble, Kendall Jenner, Kylie Jenner, and her boyfriend Travis Scott. Kylie and Travis embraced each other lovingly and shared a kiss in the crowd. The group looked happy as they soaked up the festival sunshine. Watch the service, where Kanye debuted his new song “Water,” here! Kendall and Kylie Jenner head back to their rides after dining out at Nobu on Saturday night (April 6) in Malibu, Calif. The sisters were joined by their mom Kris, with boyfriend Corey Gamble. Kylie, Kris and Corey hopped into one ride, while Kendall got into another vehicle. Earlier in the day, Kendall stepped out to pick up some plants after working up a sweat with pal Hailey Bieber. Kylie recently teased a new product coming to her Kylie Cosmetics. “ready, set, go 💕 my brand new SETTING SPRAY launches Friday 4/12 on KylieCosmetics.com!” she captioned an image of her new setting spray bottles. Check it out here! 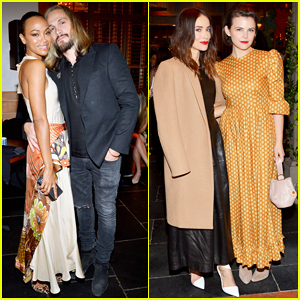 Zoe Saldana & Hubby Marco Perego Couple Up at Tamara Mellon Shop Opening Party! Zoe Saldana happily strikes a pose with her husband Marco Perego while attending the Tamara Mellon Palisades Village Shop Opening Party held at Blue Ribbon Sushi on Tuesday (December 11) in Pacific Palisades, Calif. The 40-year-old actress and Marco, 39, were joined at the event by Ginnifer Goodwin, Abigail Spencer, January Jones, Storm Reid, Juno Temple, Kris Jenner and her boyfriend Corey Gamble, as well as the desinger herself Tamara Mellonand her daughter Araminta Mellon. This marks the first-ever retail location for the brand, which celebrated its two year anniversary in October. The brand is reimagining the luxury footwear retail experience by displaying each shoe style in every size, creating Instagram-worthy shoe walls which customers can use to try on product at their leisure. Velvet and sparkles cause I’m worth it. FYI: Ginnifer is carrying an Adeam bag. Kris Jenner is enjoying a nice night out with Corey Gamble. 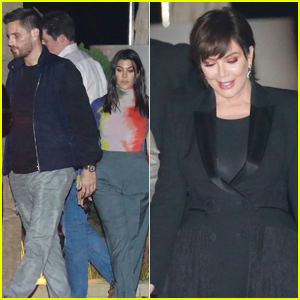 The Keeping Up With The Kardashians matriarch and her boyfriend were spotted heading out to dinner on Saturday night (December 1) at Avra Beverly Hills Estiatorio in Los Angeles. Corey was seen wearing Kanye West‘s recently released Yeezy 350 Boost in sesame, while Kris wore an all-black ensemble with a vibrant purse. Kris has reason to celebrate this weekend: she made a special cameo in Ariana Grande‘s “thank u, next” music video. Watch it if you haven’t already! Kendall Jenner Returns to Victoria's Secret Runway for 2018 Fashion Show! Kendall Jenner struts down the runway while walking in the 2018 Victoria’s Secret Fashion Show on Thursday (November 8) at Pier 94 in New York City. The 23-year-old model looked incredible in two different looks throughout the show and her mom Kris Jenner was in the audience with boyfriend Corey Gamble to cheer her on. Kris stopped backstage to wish Kendall luck before the show! This is Kendall‘s third time walking in the fashion show. She took a year off in 2017 as she was unable to participate due to her contractual obligations with another lingerie brand. The show will be airing on ABC in December!